Picture this: You're in a swoon-worthy cafe in Charleston, fawning over the sunny yellow paint job, poppy pink pillows, and emerald accessories. This is the exact color palette you envisioned for your recently refurbished home office — except the paint you wound up with is more of a "Pale Butter" than the "Bicycle Yellow" you were going for. Enter the ColorReader, a genius tool from Datacolor that instantly identifies any color you scan with matching and similar paint hues. 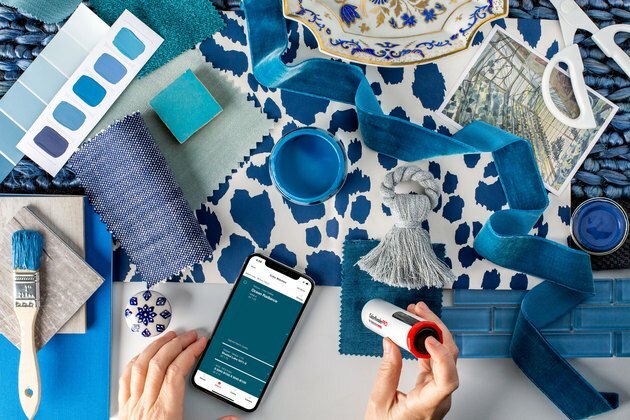 All you have to do is download the corresponding app, scan the color you're interested in, and voilà — you'll have three to four paint colors that match. The app is preloaded with colors from Ace, Behr, Benjamin Moore, Kelly-Moore, Valspar and more, so no matter your brand preference or local store, you'll be set up for success. And it doesn't just work on existing paint colors. You can scan any item that inspires you — from a bar stool to a throw pillow — and find a custom paint color that matches. Obsessed with a certain restaurant's booth color? Just scan while you order. Want to match your dining room walls to your Grandmother's wedding china? No problem. Ready to have a perfectly painted space? Shop the ColorReader from Amazon Prime below. What Colors Can I Mix to Make a Tiffany Blue?